Fragile X and Rett Syndrome – Opposite Ends of the Bell Curve? 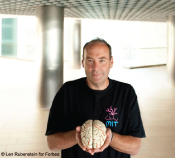 Mark Bear, Ph.D. of MIT is the most recent addition to RSRT’s portfolio of funded scientists. Prof. Bear studies synapses, the gaps between nerve cells where chemical or electrical signals are exchanged. The strengthening and weakening of synapses contributes to learning and memory but when impaired can lead to neurological disorders. Much of the excitement in the Fragile X community comes courtesy of the Bear lab. His discoveries have spawned a series of clinical trials. Monica Coenraads, Executive Director of RSRT, recently caught up with Prof. Bear to discuss his Fragile X research and how it might extend to Rett Syndrome. MC: Prof. Bear, thank you for taking time to discuss your research with us. Many of our readers will have heard of the ongoing Fragile X clinical trials and are eager to understand how your research might also impact Rett Syndrome. Please explain the so called “mGluR Theory of Fragile X” which was discovered in your lab. MB: Sure. 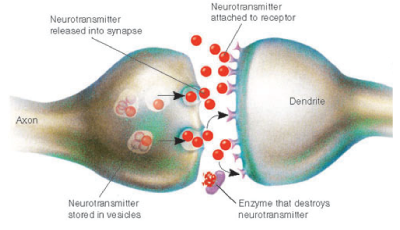 Synaptic function requires the synthesis of proteins in the synapses, so that supply can keep up with demand. Demand is registered, in part, by activating metabotropic glutamate receptors (mGluR). So the more active the synapses are, the more glutamate is released and the more protein is made. Like in many systems there are checks and balances, and one of those is the negative regulation of protein synthesis by FMRP, the protein made by the Fragile X gene, FMR1. Normal synaptic function requires a sense of balance between driving protein synthesis through mGluRs, and inhibiting protein synthesis through FMRP. In Fragile X the FMRP protein is missing so it’s like driving a car with no brakes – your foot is on the gas but there is no way to stop. So there’s excessive protein synthesis which leads to a myriad of deleterious consequences. The approach that holds a lot of promise is to inhibit mGluR which in essence takes your foot off the gas. Now that theory has been pretty widely validated and at least in the animal models of Fragile X many features of the disorder can be corrected by inhibiting mGluR. MC: You theorize that Rett Syndrome is at the other end of the spectrum, instead of too much protein synthesis, there’s too little protein synthesis. What’s behind this hypothesis for you? MB: Once we had the success in Fragile X, we started thinking more broadly about other single gene disorders that are characterized by autism, seizures, and impaired learning. I was influenced by a paper that was published by Christian Rosenmund and Huda Zoghbi. They analyzed synaptic connectivity of hippocampal-cultured neurons that either were over or under expressing MeCP2, the Rett Syndrome protein. They found that reducing expression of MeCP2 reduced the connectivity, and over expressing it increased the connectivity. We think about Fragile X as a hyper-connectivity disorder: too much protein synthesis, too many synapses, or too much synaptic turnover…and so, the Rosenmund/Zoghbi results made me think about Rett in terms of diminished protein synthesis. Also, in terms of morphology in Rett tissues we see signs of reduced connectivity –for example too few spines on dendrites. MC: You were recently at a Fragile X meeting in Edinburgh where you spent some time discussing your theory with Adrian Bird. Tell us a bit about that. MB: I was starting to mull this theory over then I ran into Adrian and had a great conversation with him. He was very encouraging – he didn’t think that this was a ridiculous idea. So that really got me charged up. We agreed that the most exciting thing is that we have drugs that can correct both excessive and diminished protein synthesis. MC: Prof. Bird called me after you and he had this discussion – he was charged up too. I organized a conference call and the three of us rather quickly decided on a collaboration and a division of labor with regards to experiments. Please tell our readers a bit about the drugs that are in existence. MB: There are two types of mGluR drugs that have been developed. One of them is the negative modulators that will inhibit mGluR. These would be used for Fragile X. The others are positive modulators that will promote mGluR activation – these might be helpful for Rett. The negative modulators were developed originally as a potential treatment for generalized anxiety disorder with the goal of creating the next generation of anxiolytics. That’s what motivated industry and they invested hundreds of millions of dollars into developing these compounds. We are really lucky in that there’s already a lot of great chemistry around our target. The positive modulators were developed for schizophrenia. MC: Novartis recently released data on a phase 2 clinical trial for Fragile X. What did you think of the outcome of that trial? MB: I think the best news is that they’ve decided to go forward into phase 3. Overall I think there is tremendous hope for disorders like Rett and Fragile X even for interventions in adults. So we are extremely optimistic and very energized to help people affected by Rett. And we thank RSRT for giving us funds to explore the disease and for facilitating a collaboration with Adrian. MC: Talk to us about Seaside Therapeutics, the biotech that you started to develop drugs for neurodevelopmental disorders. MB: When we first realized that mGluR inhibitors might be beneficial for individuals with Fragile X we reached out to big Pharma and we got a very cool reception. In those days, about ten years ago, big Pharma had very little interest in rare genetic disorders. As a consequence, I founded Seaside. So far we have been pretty successful in advancing a drug that shows great promise in both Fragile X and autism. Seaside is committed to tackling the single gene disorders. And although we do not currently have a Rett program, there easily could be if we get a promising lead, so we are eager to get to work. MC: I remember sitting in your office at MIT 6 or 7 years ago talking to you about Rett Syndrome. It’s taken a bit of time but I’m so pleased that you are now working on Rett. Our readers and I wish you much luck. We hope to hear of your success soon. This article is great and it gives me hope. It would be so amazing if there were a drug out there to help Rett and fragile x even in adults. Amazing. My Sara has Rett, and my best friend has Fragile X. Definately forwarding this article to her. I am so thankful for relentless researchers who are working so hard to help Rett and Fragile X affected people live a better life. Please don’t stop this work. Our kids need you!!!! thx for your research – your work gives our girls and us a bit of hope! Thank you so very much for your work. We pray daily for any kind of advancements that would give our girls with Rett a better life. Wow – sounds hopeful. We parents of retts girls are following you with great interest. Please keep up the journey! While I agree that there is a great hope in the research but I wonder…well.. I am a Pakistani Norwegian having a daughter born here in Norway about 8 years ago (14.08.2003) and has rett synd. Her name is SARA… when she was born, my wife was here in Oslo and I was in Pakistan. A few days after her birth I came across a self-proclaimed saint (kind of) who suggested me to not to name her Sara but I obviously did not agree.